Join us in September to experience farm living and learn hands on skills in permaculture on our abundant farm in Bali. It will be 5 days devoted to growing, making, reconnecting, community, health and setting some garden goals for the year ahead. Each day we’ll enjoy a farm-to-table family stye feast, herbal teas and treats. On the first day we will share our story; why we started a farm and our vision for the future. You’ll gain an understanding of Permaculture and how we have been applying it on our 1.5 hectare farm over the past 4 years. We’ll end the day with a seed raising and seed saving workshop. The next day we’ll spend our day talking about growing organic food. We will teach the essentials you need to know to grow your own home garden and food forest. We will teach techniques that will be applicable for both the home gardener and for those of you looking to scale up into serious food production. On Day 3 we’ll lead a practicum on how to grow zero-waste mushrooms. We’ll harvest & make some ferments, preserves, pickles and other fermented goodness. Before the end of the day we will teach you how to make some home natural products, with no chemicals and toxins for a healthy home. We believe that it is essential to get out of our heads and create something tangible with our own two hands. On this day we will focus on working with nature and creating from scratch. Together with Balinese craftsmen and some locally harvested bamboo we will immerse in the art of weaving, to weave our very own bamboo baskets. The adventurous amongst us will move on to practice some basic bamboo carpentry and build a bamboo stool. The final day will be devoted to integrating all of the learning before returning home. We will set some personal sustainability goals and Orin and Maria will be available during this session for a one-on-one consult to help you implement all you’ve learnt into your everyday life. We work with a wonderful team of Indonesian food growers, cooks, bamboo carpenters, coconut sugar makers, architects, craftsmen and designers. 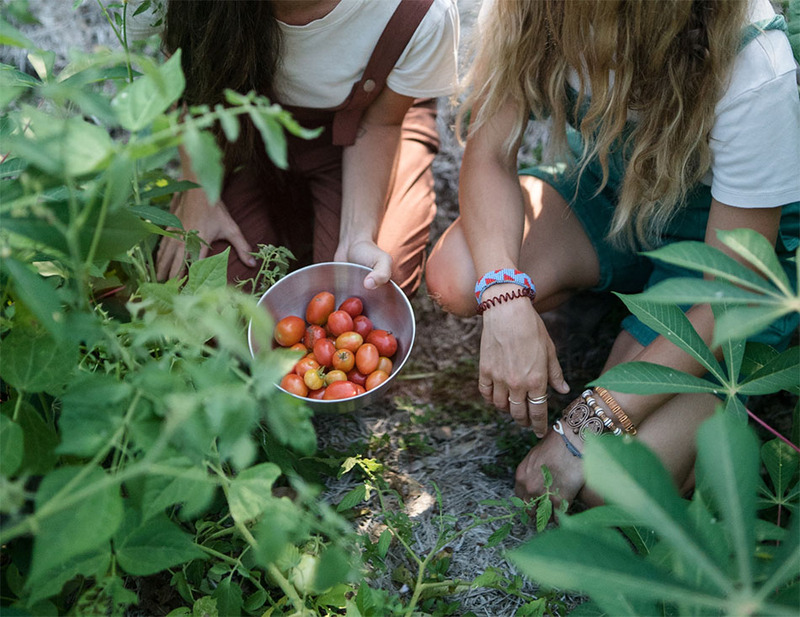 We’re committed to giving you both practical skills for daily life from growing food to making home products as well as the time to reflect and consult with us on applying these skills back home. We are located in the little village of Sibang Kaja in Bali, just a 2 minute skip away from the renowned Green School. Our farm is filled with food gardens, rainforest trees and animals (pigs, chickens, ducks, Jaga (our dog) and Malam (our cat). Your ticket includes accommodation on the farm. We have 8 bamboo yurts amidst our sugar palm grove. The yurts are shared and include fans, mattresses, fresh linens, lockers, composting toilets and warm showers. Meals will be prepared fresh for you each day. Vegetarian and vegan options will be available at every meal. US $ 895 (pls note: price is the same with or without accommodation on the farm). An early bird discount is available until May 20th, 2019. This workshop is 5 1/2 days long. Arrive on the evening of September 20th to move in, settle down, and meet the rest of the group. We will welcome you with a Balinese blessing and farm dinner. Workshops begin the following day on September 21st and end on September 25th at 4pm. We are welcoming a maximum of 20 participants for this permaculture retreat. Please place your booking as soon as possible to ensure a spot. We understand that sometimes things happen. If you need to cancel your ticket we will give you a refund, less a US$ 50 admin fee 2 weeks prior to the start date of the course. Within two weeks of the course no refund will be available, we will instead give you a credit note, less an admin fee of US$ 100, that you can use to participate in a future 2019 course. An early bird discounted ticket of US$ 830 is available until May 20th. We are offering 1 scholarship to a local Balinese permaculture enthusiast. Pls get in touch with your interest to maria@kulkulfarm.com or whats app us on +628113896070.